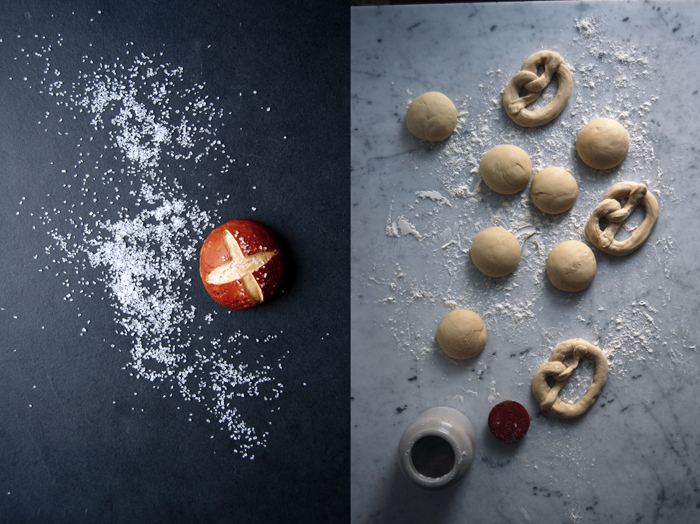 When I made my Bavarian sandwich with pretzel buns and Obatzda camembert spread last week I completely underestimated how many people would actually be interested in a recipe for the buns rather than the spread (which is absolutely delicious nonetheless!). 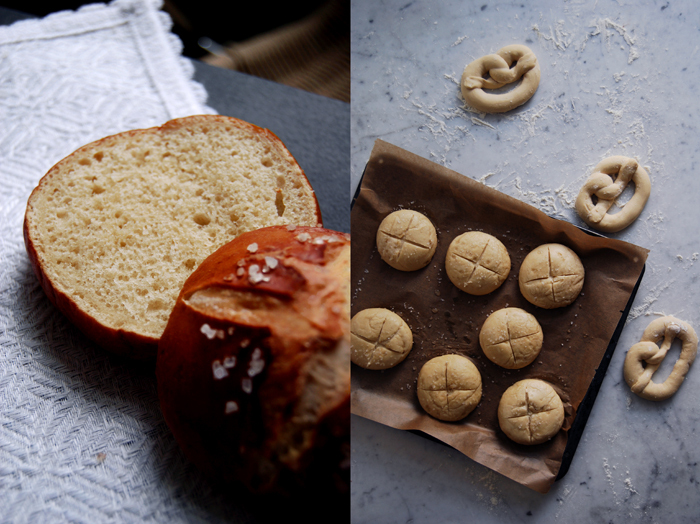 I bought the pretty Laugenbrötchen (their German name) which I used for the recipe from my favourite pretzel bakery in my area which, in my opinion, can compete with the products from their origin in the south of Germany. However, there is an ongoing discussion about the pretzel’s (and the bun’s) quality produced here in Berlin, and if you ask anyone from the Bavarian or Swabian region, they will all agree that it’s impossible to find acceptable results anywhere in this city. I disagree! 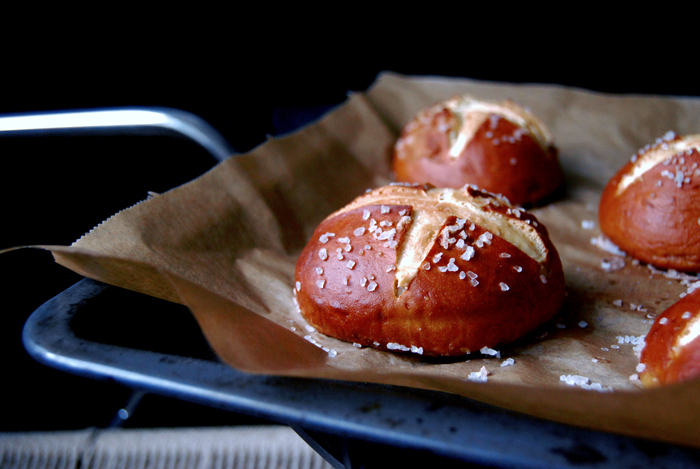 I lived in the South, I still regularly enjoy some of the best pretzel buns from my step father’s Swabian hometown Stuttgart, an unchallenged stronghold of pretzels, so I consider myself an experienced critic. The buns you saw last week on the photos were soft and spongy inside, they taste slightly buttery, wrapped in a thin brown crust with coarse sea salt sprinkles. That’s all I can ask for! The dough has to be made with a bit of butter for the rich taste, it has to rise twice and once the buns are shaped with the right technique (which I describe in the recipe), they have to cook in boiling water mixed with baking soda for one minute before baking, basically like bagels. The soda solution provides a high ph-value, not as high and strong as lye solution which is often used in professional bakeries, but it’s safer and creates a similar browning effect. When I pulled a piece off my first warm pretzel bun freshly out of my own oven, I was impressed, the texture was right, the crust perfect and the taste was fantastic. I also made a few pretzels which were nice and juicy and not dry (which I don’t like at all), but here I still have to improve. The look wasn’t right, I know this is not so relevant and, usually, not important for me at all as long as it pleases my taste buds, but we’re talking about pretzels! The top part with the knot wasn’t slim enough. They looked quite puffed up and out of shape, but they tasted amazing with some butter spread on them so I forgot about that completely. I prefer buns anyway! In a large bowl, combine the flour, yeast and salt. Mix the water with the melted butter (the mixture should be lukewarm) and add to the dry flour-mixture. Mix with the dough hooks of the mixer for a few minutes, it shouldn’t be too sticky, add more flour if necessary. 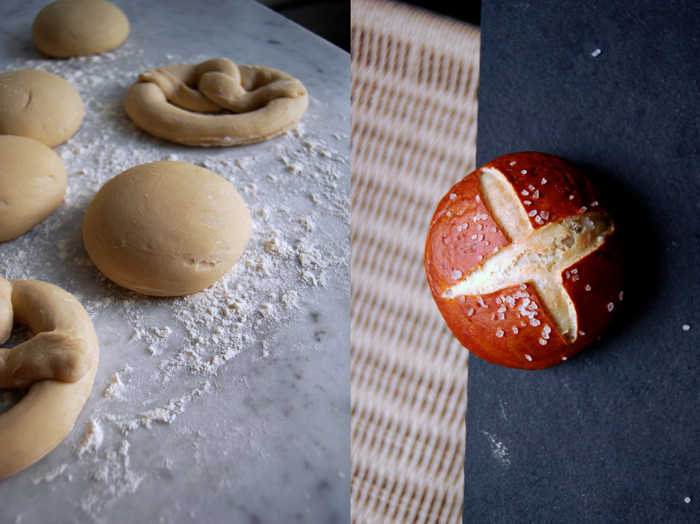 Continue kneading and punching with your hands for a few minutes until you have an elastic dough ball. Put the dough back into the bowl, cover with a tea towel and let it rise in the warm oven (35°C / 95°F) for 60 minutes (top/ bottom heat and not fan-assisted!). 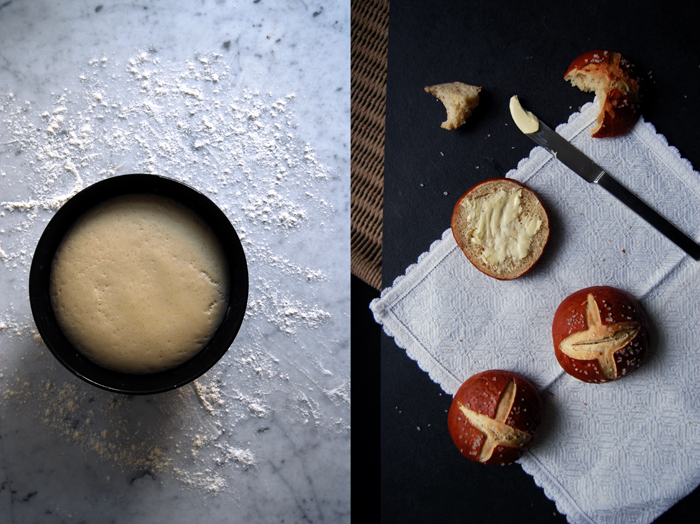 Punch the dough down, take it out and knead for 1 minute. 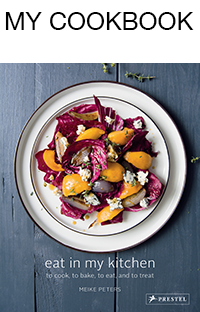 Divide it in 10 portions, each about 80g / 2 3/4 ounces. Dust your hands with flour, put a portion of dough on the palm of your hand and roll with the other hand, holding it like a dome. Turn the dough for about 1o seconds on the flat hand until its top is round and firm. This process builds up surface tension and prevents the buns from becoming flat. Continue with the remaining dough. If you make pretzels, roll each portion into a 50cm / 20″ long sausage shape, the ends should be thinner than the rest, and twist to a pretzel shape. 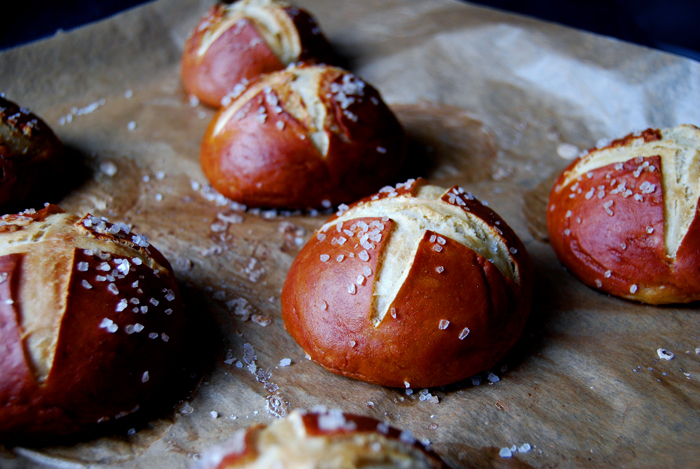 Cover the buns/ pretzels with a tea towel and let them rise for 20 minutes in a warm place. Set your oven to 220°C / 430°F top/ bottom heat and line a baking sheet with parchment paper. In a large pot, bring 1l / 4 cups of water and the baking soda to the boil, watch it as it will start bubbling. The pot should be wide enough for 2 buns to fit in, they don’t need to be completely covered with the solution. Gently put two buns with a slotted ladle into the boiling water and cook for 1 minute. Mind that they don’t stick to the bottom and turn them after 30 seconds. Take them out after a minute and put them on the lined baking sheet. Sprinkle with coarse sea salt and continue with the remaining buns. Bake for 16 minutes or until golden brown, the pretzels need just 12 minutes. 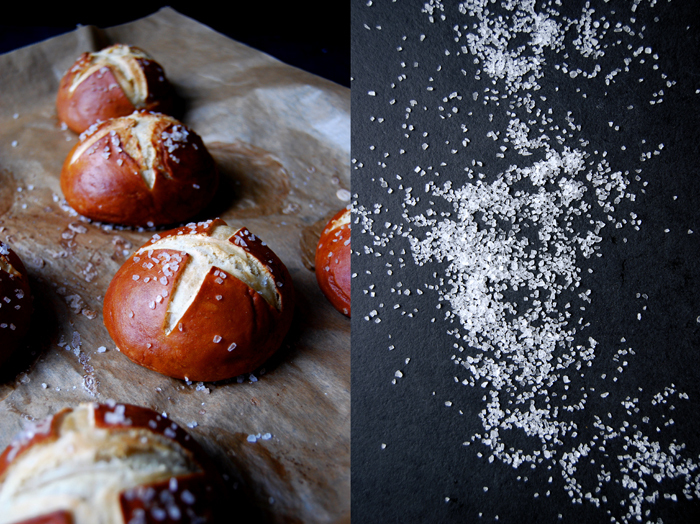 If you want to freeze the baked buns / pretzels, don’t sprinkle them with salt. This is the second time I’ve tried making pretzel buns, and I keep getting these weird raw spots on the bottom outside edge. Do you have any idea what the problem might be? Hi Amber, I’ve never had this problem (and never heard of it). Do you leave enough space between the buns while baking or do they touch each other? Some yes, some no, but it happened just the same with your recipe and another I tried. It sort of looked like pockets of water soaked into the dough and got sealed in by the outside being slightly cooked. I completely confused. 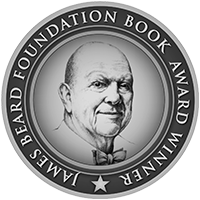 I’ve been baking many types of bread for quite some time, and I can definitely say this is unique. That’s strange! Are you using baking soda and the right ratio between water and baking soda? Do you also have this problem when you make bagels (as they are also cooked in water first)? How large are the buns when you divide the dough into portions of 10? I am making these to use as hamburger buns and was thinking about portioning it into 8ths. Have you tried this? Would it increase baking time by a couple of minutes? I never made 10 portions, when you make 8 buns I think each is about 3″ (I never measured them). I’d add 1 minute to the baking time and cut 1 open to check. Enjoy! Hi! These look amazing. Am just about done making them and just was wondering when in the process you score them? (I did it right before putting them into the oven, after the boiling and salt) Also what’s the recommended cooling time? Hi Sarah, that’s right, you score them just before you put them in the oven. I love to eat them warm, but let them cool for a few minutes first. Enjoy! I was wondering if you ever determined the best way to freeze these bun? I can’t wait to try this recipe. Hi there, after searching through what seemed liked hundreds of recipes, I have finally stumbled upon your site. I am looking forward to making these on Friday. I have been living in Germany for the past four years and have always wanted to bake these myself. The only question I do have, is what is exactly meant when you say to lightly flour your hands, place the ball on one palm of the hand and roll with the other? Thank you! Thanks again for the recipe! I can never get that deep golden brown on my pretzels! Any advice? You could add more baking soda. However, 3 tablespoons baking soda for 1l / 4 cups water works really well for me. 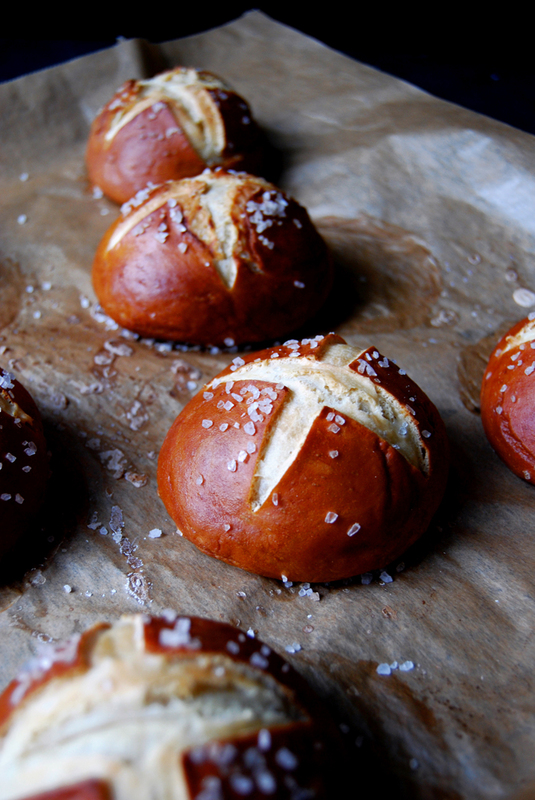 The lye solution used in professional bakeries will always create a darker pretzel bun. Just made these, they turned out perfectly! Shiny and a little tangy on the outside, so soft inside. Thanks for the recipe! Hi, That’s great! 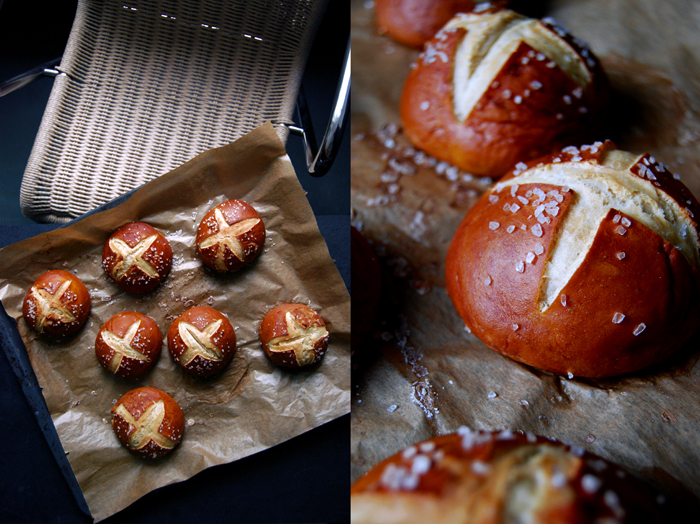 I love Pretzel Buns, especially warm with a little butter – heaven! Have a nice Sunday! To make a higher PH solution. Bake your baking soda. About 1/2 cup in the oven at 300 for 1 hour. This will boost the PH of the baking soda. I use about 6 cups of water to 1/2 cup of the baked soda. It’s a rather dramatic difference in the texture of soft pretzels that is very close to the street vendor pretzels. This is also great for home made bagels. Ahhhhh I’ve been seeing pretzel-ified stuff a lot lately and I NEED TO GET ON THIS. These look amazing and would make any sandwich a million times better. Lovely! They’re absolutely beautiful, Meike!! They look wonderful. Thank you for sharing!